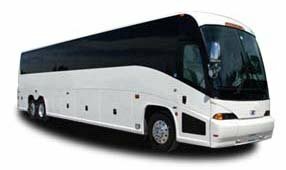 The 56-passenger MCI Charter Bus is one of the largest and most luxurious coaches on the market. Because of its immense size, this coach is able to comfortably transport large groups over long distances. Safety and security are always our top priorities, and on the 56-passenger MCI, that’s exactly what you get. Contact Las Vegas Charter Bus Company at any time to get more information about our services. We have 24/7 reservation agents that are ready to get you what you need. Call us today at 702-780-0886.